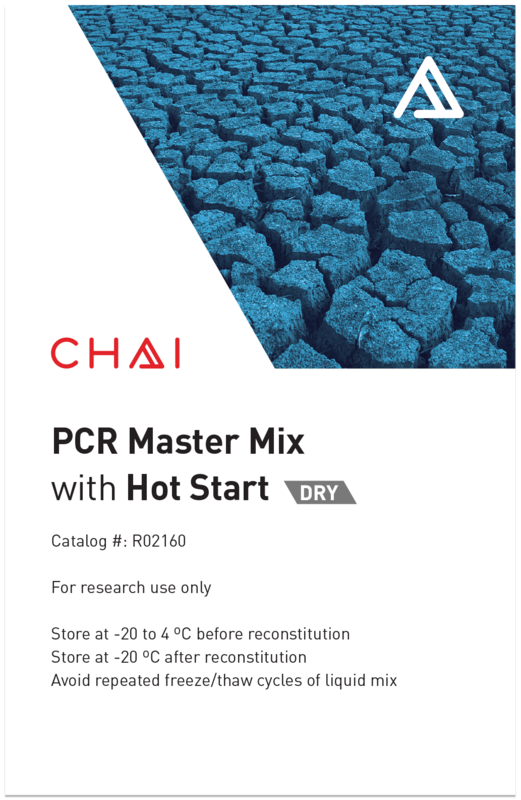 Chai’s Dry PCR Master Mix is optimized for routine PCR and qPCR. It is lyophilized for ambient temperature shipping and can easily be reconstituted with the provided buffer. The mix is optimized for Real-Time PCR, capable of 100% PCR efficiency, and is compatible with all standard probe and dye-based chemistries. The mix combines numerous PCR enhancers and stabilizers with a novel aptamer-based hot start mechanism, resulting in exceptional qPCR performance. This mix is validated for products between 100 bp and 5 kb. Five ten-fold serial dilutions of Ara h2 gene fragments were used as template to amplify a 124 bp product. Five ten-fold serial dilutions of Ara h2 gene fragments were used to create a PCR standard curve. A 124 bp product was amplified using Chai PCR Master Mix + Hot Start (Dry) and a FAM labeled TaqMan probe, with an efficiency of 93.76%, slope of -3.481 and R2 value of 0.99997. A GAPDH-HPRT gene fragment was used as template. A 123 bp GAPDH amplicon was detected using a FAM labeled TaqMan probe, and a 98 bp HPRT amplicon was detected using a HEX labeled TaqMan probe. Amplification performed with Chai PCR Master Mix + Hot Start (DRY). Reconstitution: Remove seal and cap from the vial of freeze-dried PCR Master Mix with Hot Start. Add 0.66 mL reconstitution buffer to the freeze-dried vial. Gently pipette up and down at least 10 times to ensure solution homogeneity. Avoid bubbles. Do not vortex. The liquid 2X Master Mix is now ready for use. Assemble the reaction components on ice (preferred) or at room temperature (up to 30 °C). The recommended reaction volume is 25 μL. Reaction volumes between 10 and 50 μL may be used; scale up/down the reaction components accordingly. Transfer the reaction(s) to a thermocycler. No separate activation step is required. Final concentration of the Master Mix in the reaction should be 1X.